Can a DVD Recorder Without an RF Input Record TV Programs? 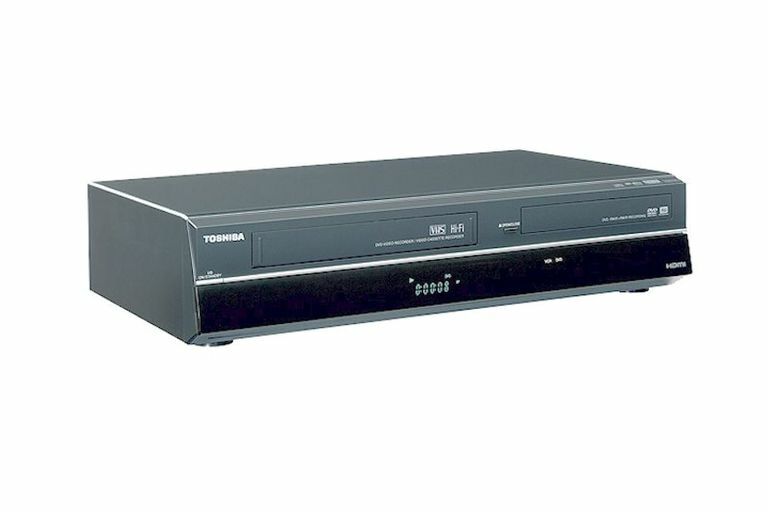 Toshiba DVR620 Tunerless DVD Recorder/VCR ComboDVR620 Tunerless DVD Recorder/VCR Combo. DVD recorders are designed to record video from a variety of sources, including camcorders, copying from VHS to DVD, and, for many, recording TV programs. However, depending on the brand and model of DVD recorder or DVD Recorder/VHS Combo, connecting to an antenna, cable, or satellite box may require different connection options. If you have a DVD recorder with a built-in tuner, it will have an antenna/cable RF input that you can connect an antenna, cable, or satellite box into for recording TV programs. When using an antenna, just simply connect your antenna cable to the RF (Ant/Cable) in of the DVD recorder. You can then use the DVD recorder's built-in tuner to set the channel and recording time. If you have an older DVD recorder (most made before 2009), even though it has a built-in tuner and RF (antenna/cable) input, you cannot record TV programs received by an antenna because all TV stations broadcast programs digitally which is incompatible with old analog TV broadcast system used before 2009. In order to use a DVD recorder that has an analog tuner, you will need place a DTV converter box between your antenna and DVD recorder. What the DTV converter box does is convert the received digital TV signals back to analog so that it can be used by a DVD recorder that does not have a built-in digital tuner. If you receive your TV programs via cable or satellite, you will have to make sure that the cable/satellite box is connected between the cable coming from the wall and the DVD recorder. Connect an antenna to RF/Antenna input of the DTV converter or cable/satellite box. Connect the DTV converter/cable/satellite box RF/Antenna output to the DVD recorder's RF/Antenna Input. To record a TV program, you will have to set the DVD recorder to channel 3 or 4 (set at DTV converter or cable/satellite box) and set the channel you wish record using the DTV converter/cable/satellite box. What this means is that the DTV converter or cable/satellite box controls what channels are received by the DVD recorder - you cannot use the DVD recorder's tuner to set the channel you wish to record. Another connection option you have to receive TV signals is, instead of connecting the RF output of the DTV converter/cable/satellite box to the RF/Antenna input of the DVD recorder you can connect the AV outputs (yellow, red, white) of the box to corresponding inputs on the DVD recorder. In this case, instead of setting the DVD recorder to channel 3 or 4 to receive and record programs, you select the DVD recorder's AV or Line input to receive and record TV channels and programs. Although DVD recorders are becoming very rare, most units that are available are now tunerless. What this means is that the DVD recorder does not have any way to receive or record TV programs using an antenna/cable connection. If you receive TV programs via antenna, place a DTV converter box between the antenna and DVD recorder. Connect the antenna to the RF input on the DTV converter box and connect the AV outputs (yellow, red, white) to corresponding inputs on the DVD recorder. If you receive TV programs via cable or satellite, connect the AV outputs (yellow, red, white) of the cable/satellite box to the AV inputs of the DVD recorder. You then use the cable/satellite box to set the channel and time you wish to record. However, it is important to point out that when trying to record from cable/satellite, that many channels and programs are copy-protected. This means that you may not be able to record many programs directly to DVD. However, if you have a DVD recorder/Hard Drive combination, you may be able to record programs onto the hard drive, but you could be prevented from making a permanent copy onto a DVD disc. Although most consumers record TV programs on cable/satellite DVRs and the availability of DVD recorders has greatly diminished, there are still many in use. However, depending on the brand and model, there are differences on how you will have to connect and set it up for recording TV programs. However, in addition to above tips, also consult your DVD recorder's user manual for any additional setup requirements or operational features that may affect the video recording process.